Controversial GMO Mosquito Experiment: Frequently Asked Questions : Goats and Soda What are some of the leading arguments against this experiment? What happens to other species in the food chain? Isn't developing a vaccine a better way to go? The engineered insects carry a genetic mutation that is lethal to its species. And that could turn out to be a potent weapon in the war against malaria. But as with all genetic modifications, there's a deep concern about unintended consequences. We asked readers to share their questions about this GMO mosquito experiment. Nearly 300 questions were submitted, on topics ranging from its potential impact on the food chain to alternative solutions like developing a malaria vaccine. Here are some of the most frequently asked questions, answered by Rob Stein. What happens to all the other species in the food chain, like bats and birds, that depend on mosquitoes as a food source? And what about their role as pollinators? Mosquitoes do play an important role in the food chain. Bats eat them. So do birds, as well as fish, frogs and other animals. But there are hundreds of mosquito species. So many that scientists think dramatically suppressing, or even completely removing, just one would not significantly impact the food chain. Many other mosquito species would still available for these animals to eat. Mosquitoes are also pollinators. 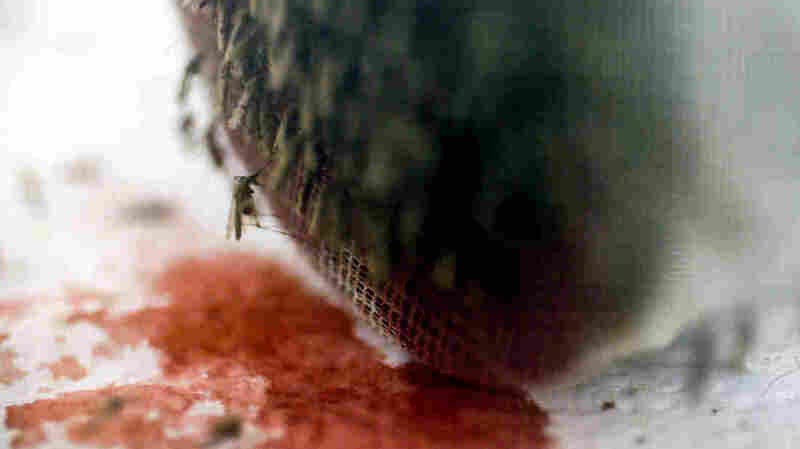 But, again, the idea is that other mosquito species and other insects would be unaffected — and so would remain in the environment to fill that role in the ecosystem. Scientists say research conducted so far indicates that the targeted mosquito, Anopheles gambiae, is not a "keystone" species – meaning its disappearance would not have a significant negative ecological effect. But these are all important questions that scientists involved in the Target Malaria project, which is developing the new kind of modified mosquitoes, say they are studying intensively and still need to understand better before any release is considered. Critics say ecosystems are too complicated to ever know for sure. The female mosquitoes only become infertile when they inherit two copies of the mutation that has been introduced into the mosquitoes using the gene-editing technique CRISPR and a sequence of DNA known as the "gene drive." That enables the females to spread a mutation in the gene to future generations of offspring and mate with unmodified counterparts. The thinking is that local populations of this species of mosquito would eventually crash, or drastically reduce, once enough of the females have inherited two copies of the mutation, rendering the populations unable to sustain themselves. In tests in small cages in London, unmodified mosquito populations crashed within seven to 11 generations, which took about six months. Scientists have spent decades trying to develop an effective vaccine against malaria. But the life cycle of the malaria parasite has made success elusive. The one vaccine that has been developed is only partially effective. So while work continues to develop better vaccines, many scientists think that other approaches are urgently needed, especially since malaria still takes a major toll every year — an estimated 212 million cases and 429,000 deaths. And efforts to reduce malaria using other approaches, such as treated bed nets, appear to have plateaued in some places. There are two. The first is that "gene drives" are too dangerous because ecosystems are so complicated that it's impossible to predict what would happen if an organism engineered with a gene drive was ever let loose in the wild. The concern is that these genetically modified organisms could have myriad unintended and unpredictable consequences. One fear, for example, is that dramatically suppressing or even eradicating one mosquito species could create a niche in the ecosystem that would allow another species to move in carrying other, possibly even more dangerous health problems, such as other insect-borne diseases. The other argument critics make is that there are other, less worrisome alternatives that could be used to fight malaria, such as improving water systems and sewage systems so that they don't serve as breeding grounds for mosquitoes. The scientists argue that the gene-drive modified mosquitoes approach is actually much more targeted than the approach that has been traditionally used – large-scale use of pesticides, which does much more extensive ecological damage than removing a single species of mosquito. Target Malaria says it has an extensive outreach program that has been underway for some time to develop this program in close consultation with the national governments and local community leaders in places where any future releases may occur. This includes Burkina Faso, Uganda and Mali. Project organizers say they are working intensively to educate people in those places about this technology, and that releases would only occur if it's clear that the local populace has been truly informed about the benefits and risks, and there is a broad consensus that this would be acceptable. Critics, however, question whether the program is really getting true informed consent, saying local residents appear not to have been well informed and have deep reservations about the project. The scientists involved in the Target Malaria project say there generally is no "gene flow" between the different species that spread malaria in Africa and other species of mosquitoes that are not transmitting malaria. In Africa, malaria is transmitted by three main species that all belong to the Anopheles family. Within this family, there can be "very occasional matings" and therefore the passing of genes between Anopheles gambiae and Anopheles coluzzii when they are in the same location, says Ruth Mueller, an entomologist who runs the lab testing the mosquitoes. But since both species transmit malaria, this gene flow could be "considered a benefit" because it could suppress those mosquitoes as well. Most of the other Anopheles gambiae mosquitoes rarely mate with other species, and some species never meet, so gene flow is generally "very low or zero in the wild," Mueller adds. But the plan is to study this question further. Scientists are very interested in using this approach to fight other problems caused by insects and other creatures. Scientists at the University of California, Davis, for example, are working to use CRISPR and gene drives to fight a species of fruit flies that is a major problem for the farmers growing crops like berries, as well as other species of mosquitoes that spread other diseases, such as Zika. Other scientists are working on developing a related approach to fight Lyme disease, carried by ticks and possibly to fight invasive rodents that are damaging fragile island ecosystems in New Zealand, Hawaii and elsewhere. Thank you to everyone who participated in our callout. Follow Rob Stein on Twitter at @robsteinnews to keep up with his coverage of this topic and more.